Members are invited to renew their membership between November 1, 2018 and January 31, 2019. Ms. Arica Hill holds a Masters in Environmental Management from Bond University, Australia. 2016 Wildlife Calendars here, please support the EAG efforts by making a purchase. EAG calls for motivated leaders to sit on its board of directors, submit application now. Sign up early for EAG'S Turtle Watch Trip starting on the 10th, July until the end of September from 7:30 pm to 11:00 pm. The EAG and partners are gearing up for the 5th year of Camp GROW "the best summer camp in Antigua". EAG will be hosting an event for youngsters on Saturday 4th July, for children ages 6 to 12, inspiring them to appreciate their natural heritage by starting with Caribbean birds. Seeking Participation for the Bat Survey and Bat Conservation Workshop, August 2015. We encourage you to sign a letter to Prime Minister Gaston Browne petitioning the Government of Antigua & Barbuda to uphold the relevant laws. 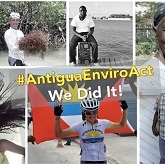 On Thursday April 23, the Parliament of Antigua and Barbuda met to debate the Environment Bill for the last time. Check out the latest news from the EAG in their newsletter, highlighting upcoming events like their Field Trip and meetings, along with a review of the recent Gala Dinner. Support the proposed Environmental Protection and Management Bill to help protect and maintain the environment. Check out the short film that Disney produced about the Antiguan Racer Snake, filmed on Great Bird Island. Take a trip back in time with us. Our 2013 EAGer highlights events from our past year including Camp Grow which is happening again soon. A fantastic opportunity for your children - Camp GROW is back! Are you interested in becoming a turtle watch volunteer? If so, please let us know! The EAG regrets to inform you that tonight’s members meeting will have to be postponed due to the illness of the feature speaker. The new date for the meeting will be the 4th February at 7 pm. Our sincerest apologies for any inconvenience that this may have caused. 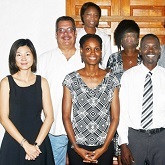 Antigua's Environmental Awareness Group reports on International Coastal Cleanup Day. Exploring the history of the Antiguan racer snake and how the population was decreased to the brink of extinction and the efforts in place now to recover the species. EAG is about to get down to some serious turtle watching once again, and EAG members are being called upon to help lead trips. Also, Camp GROW is coming up soon! The Environmental Awareness Group and GARD Center are excited to announce the return of Camp GROW! March Field trip- Whale Watching! Check out the latest news from EAG including ECAB Green Initiative, EAG 2013 Calendars, Volunteer- Trail maintenance, EAG Talk Articles Every Thursday in the Daily Observer. The 2013 CWC count will take place from Monday, Jan. 14 to Sunday, February 3rd inclusive. This includes 3 weekends and World Wetlands Day on Feb. 2nd. 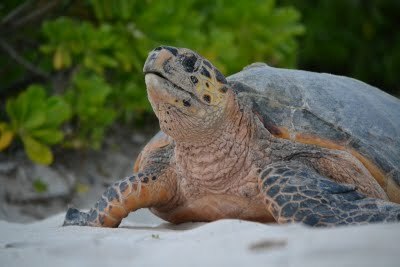 As the year comes to a close, so does our 2012 season for nesting sea turtles in Antigua. Check out the latest updates from the Environmental Awareness Group. Caribarena.com recently reported on the continuing discussion about sea turtles in captivity. The EAG is seeking volunteers interested in dedicating one hour each week to sharing eco-stories with a primary school class this Fall. WE WANT YOUR PLASTIC SHOPPING BAGS! Camp GROW 2012 is fast approaching and needs YOUR help! This year our campers will be making their very own jump ropes out of used plastic shopping bags – and with 60 campers – we’ll be needing a lot of bags!! The EAG has placed drop boxes at Marinas in English and Jolly Harbour for any one who can spare some change, as well as for those who are here for the regatta, and need to get rid of their spare change before they leave. Funds collected go toward various conservation projects that the EAG gets involved in. 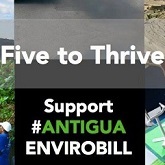 Antigua’s Environmental Awareness Group will be collecting loose change during Antigua Sailing Week to raise funds for its projects. The Environmental Awareness Group invites you on its whale watching field trip on April 14. The Christian Valley Birding Trail was officially opened last Thursday, and there are high expectations that not only visitors, but also locals, will take the nature trek that extends to Mount Obama. Join the EAG field trip that will take you across the seas, but not too far! GET YOUR 2012 SPECIAL EAG CALENDAR TODAY! The Environmental Awareness Group is pleased to announce its first-ever publication of calendars. Are you interested in developing a back yard garden that will meet all your needs including not only food production but also beauty and diversity? There is still much work to do. 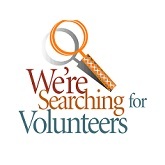 Anyone wishing to volunteer some hours/days in the next week or so to help out, please call Steve Watt at 764-5283. Read this blog post by Jordan Schaul of the Alaska Wildlife Conservation Center on National Geographic's News Watch. The EAG needs your help!! Are you looking for work? Do you want to make yourself more marketable and be in a position to go after the trend setting jobs. There is a demand in the eco-tourism sector both here at home and regionally, for trained persons in the technology of nature trail blazing and maintenance. Are you concerned about the lack of legislation and enforcement on issues such as: Protected Areas, the Environmental Impact Assessment (EIA) process, protected species, watersheds, wetlands, fires, goats, recycling, pollution and many other environmental issues? The GARD Center and the Environmental Awareness Group are excited to announce their partnership in presenting Camp GROW, an environmental and agricultural summer day-camp for children ages 9 -12 which will be held July 11th thru July 22nd. February marked the start of another nesting season for our Critically Endangered Leatherback sea turtles. The EAG is taking part in the first Caribbean Waterbird Census, an initiative of the Society for the Conservation and Study of Caribbean Birds. A classroom session will be held on Thursday 6th January 2011 from 2:00 pm to 5:00 pm upstairs the museum. Magnificent Frigatebirds are one of the most recognizable seabirds as well as one of the most threatened. Antigua’s offshore islands are refuge to some of the world’s rarest species of fauna and flora. EC$7,755.28 RAISED - THANK YOU! Thank you to all those who helped make the Green Fete a great success -- we raised $7,755.28 for the EAG and it was a fun lime! Nominations are now officially open for the 2011 Champions of the Earth – the United Nations’ flagship environmental award. 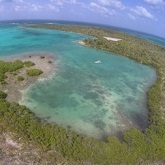 The EAG focus on conservation of our offshore islands has been awarded “Best Lessons Learned” project by the Eco-Index. In the midst of carnival, Antigua & Barbuda will be witnessing a special collaboration this year. Do you have an environment-related topic that you want to explore and share with others? THANK YOU FOR MAKING EARTH DAY A SUCCESS! Thank you to all of those who participated in our Earth Day events! The Offshore Islands Conservation Programme (OICP) of which the EAG is a partner is currently conducting a census of our Antiguan racer snakes on Great Bird Island and we welcome any help that you can volunteer towards this effort. EAG and the MOMENT is CAPTURED Continue Their Series of Nature/Photography Hikes in Search of the Christian Valley Waterfall. 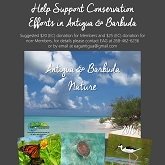 The publication The Wild Plants of Antigua and Barbuda is now available for sale! EAG and the MOMENT is CAPTURED Begin Series of Nature/Photography Hikes Local environmental group joins forces with photographer for combined nature walks and photo ops documenting Antigua's flora and fauna. A recent field trip uncovered a surprising find.